The artistic evolution of Dustin Mills so far has been somewhat similar to Bjork. While both apply their trade to different fields of art, they share an uncompromising tendency never to repeat themselves, creating outside the box works, with consistently excellent results. 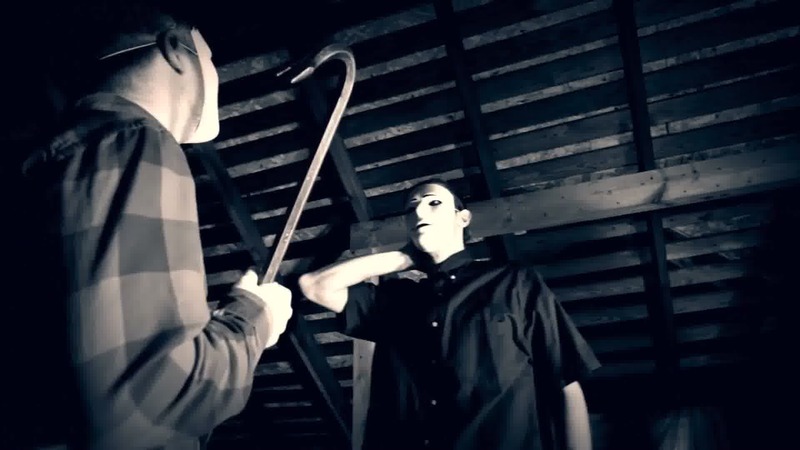 Not many filmmakers working today compete with Dustin’s unpredictability and tireless work ethic; with an average of 4 projects a year and each of them being different to the others, he’s an exciting talent to follow if you’re an indie horror fan, but even his most long-term die-hard followers couldn’t have predicted a film like Applecart. Needless to say, there aren’t many films out there like Applecart. 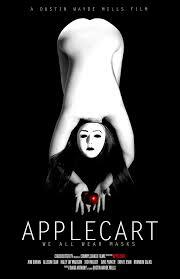 Applecart is an avant-garde portmanteau film comprising of 4 shorts: ”The Sleepover,” ”Caretaker,” ”Dad” and ”Let Me Show You Something”, all of which are shot in the style of a 1920’s black and white silent film, with the only sounds being a recorded audience track and burlesque style photoplay music. All of the characters wear white masks at all times; a symbol for their deepest, darkest secrets, and their emotions are impressively conveyed through body language. Throughout the film, the only food eaten by the characters is apples; this is a representation of forbidden fruits as we watch them indulge in sheer depravity. Applecart is not a film for the faint of heart; running at approximately 56 minutes, Mills is somewhat a merciful towards his audience, because despite being an excellent accomplishment, it isn’t the easiest of content to stomach. Tackling themes such as domestic abuse, abuse of the elderly, abuse of women and sexual perversion, it’s an unfortunate mirror of the real world we live in as opposed to mindless exploitation fodder that would be easier to digest if we didn’t think our neighbours might be capable of such acts. Despite portraying such themes in the extremist of manners, reality has proven time and time again they aren’t necessarily hyperbole. Applecart represents fear of normalcy; who knows what goes on behind closed doors when it comes to our colleagues, friends, neighbours and even family? Putting madness on the screen is easy. Having meaning behind it is something else entirely, and Mills most certainly has a message. The cast consists of Mills’ regulars Erin R. Ryan, Allison Egan, Haley Madison and Dave Parker. Kudos to every single actor and actress for not only for their bravery to be a part of something so bold, but to carry a film without words and convey every emotion with a body movement is an outstanding accomplishment. This is not a film that’ll cater to all tastes; the most open minded viewers might find it too odd and perplexing, and the most jaded extreme aficionado’s might find the content to be too grim and disturbing. But if there’s one thing any objective viewer could agree on it’s that the cast delivered.